Down, down, down you go, where you’ll stop—no one knows. In the game Legend of Grimrock you play the role of anywhere from one to four prisoners that are trying their damndest to escape this mountain prison. You start out on level One of the prison and as you progress through the game you go deeper and deeper on to level Two and Three and so on. However you’re not the only people in this dungeon, along the way you’ll find markings on walls and letters on floors as well as creatures that are there to stop you at whatever cost. When you start the game you’re given the choice to create your own characters or let the game create a party for you to play. You can—but don’t necessarily have to — have four members in your party. However the more the merrier (unless you find a hidden Easter Egg they’ve put in there for some One on Dungeon action.) There are three classes; Fighter, Mage, and the Rogue. 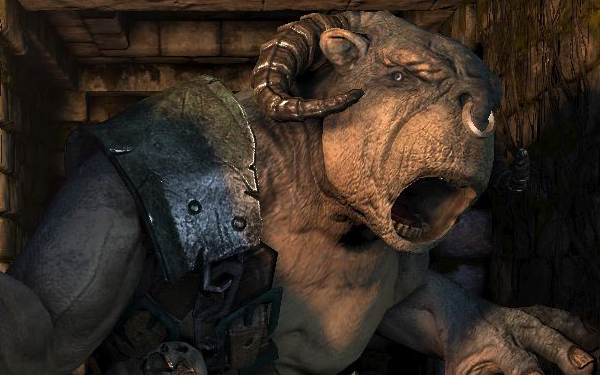 And there are four races for you to choose from; Human, Minotaur, Lizardman, and Insectoid. Each Race and class has their own advantages and disadvantages. Some combinations are better than others for instance a Minotaur Mage makes less sense than an Insectoid Mage; however you’d probably love to have a Minotaur Fighter. Granted you can do whatever combinations you’d like. During character creation you can add up to four Prisoners’s and give each multiple Traits, for instance the trait Daemon Ancestor says “Your Great Grandfather had fiery eyes – Resist Fire +25”. And once you’ve chosen your class and race you get to assign skill points to that class’s skill set. As you go farther and farther down into the mountain prison, you come across more and more dangerous traps, monsters, and more difficult puzzles. If you look hard enough you’ll come across a few secrets on each level as well which can yield wonderful magic items that will be of tremendous help down the road. As you kill monsters like Giant Mushrooms, Frost Raptors, Skeletons, and Troll’s you gain experience and level up. Leveling up allows you to increase your skills to use different abilities and increase your effectiveness in combat. There are thrown weapons and melee weapons; some can reach further than others and each weapon type has specific abilities that coincide with the respective skill. For instance, Maces can ignore armor later and Swords can attack faster. The way the characters are set up is in a two-by-two square; two members in the front and two in the back. You can change the order around by dragging each of the prisoner’s to a different spot. This allows you to place your “tanks” in the front and let your ranged characters sit in the back and take no damage. However, when a hallway has more than one runoff the side characters are vulnerable as well. A skilled player can adapt to the situation and overcome the adversity! Moving is a matter of turning, strafing, walking backward and forward with the Q, W, E, A, S, D buttons. If a member of your prison break team dies, there are life crystals throughout the game that will allow you to bring them back to life, so if you lose one or two in a tough fight—have no fear—they’re not gone for good. One of my favorite aspects of this game is the magic casting. So much so I decided to give it its own paragraph entirely! In most games, magic is something that’s just an innate thing that you’re able to do and you learn spells as you level up. That is not at all how it is in LoG. When you have a mage in your party they start with anywhere from 0-3 spells depending on how many points you put into the different magic schools. 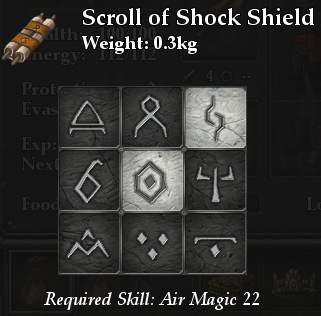 As you go along throughout the game however, you’ll find scrolls that show you the runes setup to cast specific spells, and in order to successfully cast the spell you have to have a certain skill level in that school of magic. When I say rune setup I mean, in order to cast spells you have to open the magic menu — whether that’s from your mages hand, staff or orb — and then a set of nine runes shows up and you have to click on the specific runes shown in the scrolls that will allow the spell to be cast. There are no preset spells that you can just click cast, you’ve got to click on the runes each time. This mechanic is wonderful, it gives some sort of old school realism where you’ve got to prepare the spell before casting it, and you’ve got to either read the scroll or have it memorized. All in all, the combat system strikes me as perfect—at least for this game style anyway. 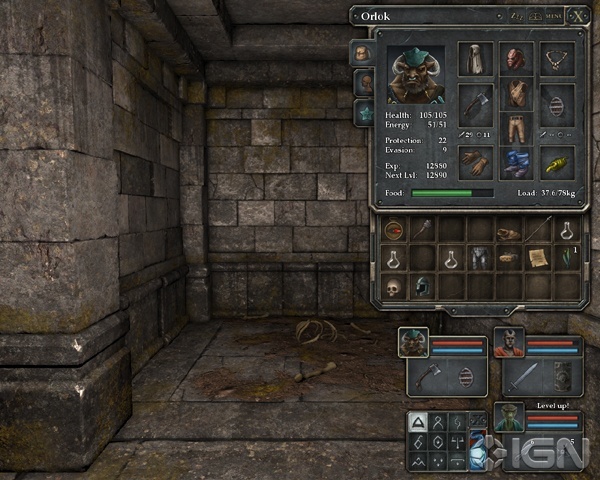 The Legend of Grimrock is the best current dungeon crawl/puzzle game I’ve played. When Almost Human sat down to put this game together they did an outstanding job. 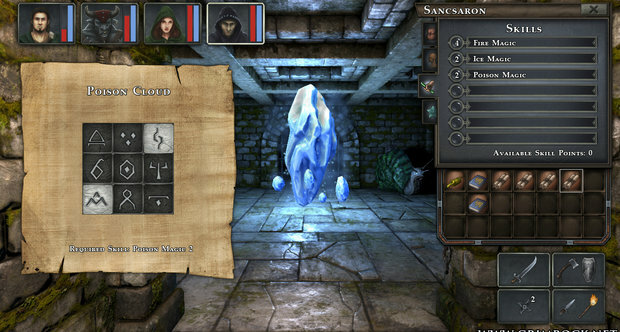 The combat system is functional and makes complete sense for the setting and style of the game. And the story is pretty compelling, I mean if you were stuck in prison with some experienced adventurers, wouldn’t you want to escape? If you get the chance to snag this game I say go for it. Great price on Steam, for many hours of gameplay.